If you're as detailed as me, you've noticed scuffing on your shoes. If you haven't noticed and don't care, then carry on. This simple fix utilizes only a marker (I used a fine tip Sharpie). I learned this trick from my Dad who used brown markers to show me how to touch up simple furniture knicks, scratches, and scuffs. It works just as well on my nice heels! All you need to do is color the scuffed leather edge with a marker that matches! This super simple fix is easy, inexpensive, and takes very little time. Do you have any handy household tricks used for maintaining your fashion and accessories? Please share! I normally do that with nailpolish, because I made the experience that this keeps better on the shoe! HaHa Mary Ann! At first I was like, what's wrong with the shoes? LOL Now that is detail. What a great fix! Great tips!! We'll have to try it out. 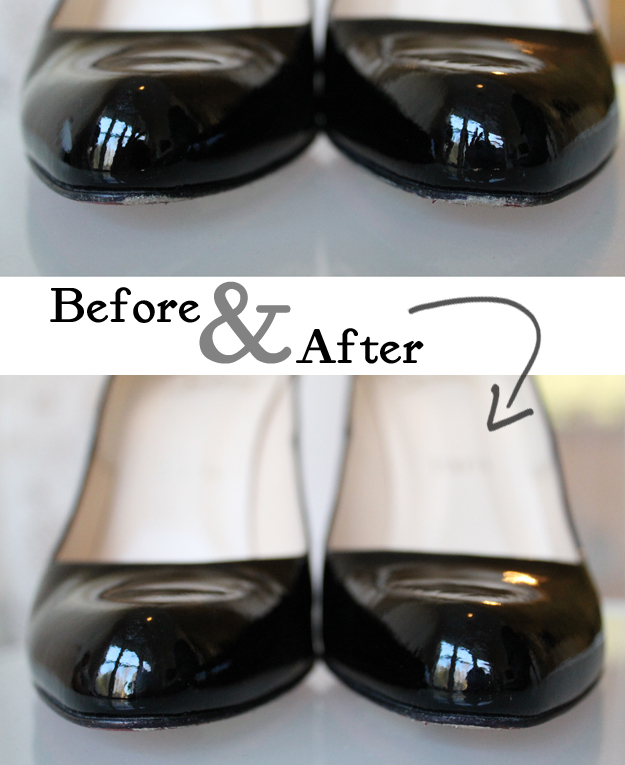 This is definitely an awesome quick fix for when shoes get scuffed up. Thanks for the tip! Also, thanks for stopping by over at my blog - following you now :) Would love if you do the same! Magic Erasers remove all sorts of scuffs and marks from shoes and bags. Love them! Nail polish remover also removes scuffs off patent leather. Google told me so. And I tried it and it was right! Great tip, it "hurt" me when i saw a scuff on my shoes, now I can prevent it easily . Thanks for sharing. Thanks for your tip! to be honest, I've also done that, only I've used a normal permanent marker!! i totally do this, and it shoes how well it works because i can't tell the difference in the after picture except that it looks fixed! Thanks for the share, I have the same problem with most of my shoes!! 1) I seriously just reached in my desk, pulled out my sharpie and promptly starting touching-up my black heels! Love this easy (and super affordable!) idea. 2) LOVELOVELOVE your yellow peplum blouse in the previous post. You look gorgeous and the cuffed sleeve details are beautiful...great sewing work girl! Looks wonderful. Thanks for the tip. I have some shoes I will definitely be trying this on. That is awesome, simple, and quick! Thanks for sharing. For the insides of my shoes, I use baby wipes to clean them. I've done that a bunch of times, too! I've even used sharpie to color bleach spots in clothes. Yeah, its a bit cheap looking but when you're bartending, no one can notice! That's an awesome idea <3 Great post mary <3 Love your blog & outfits!!!! Beautiful blog and posts! Would you like us to be friends and follow each other? What an interesting idea! So simple, but it works so well. and then only i will try these on mine.